Home > Resources > Blog > 2018 Blog Posts > The Cascade User Conference is Next Week, Are You Ready? 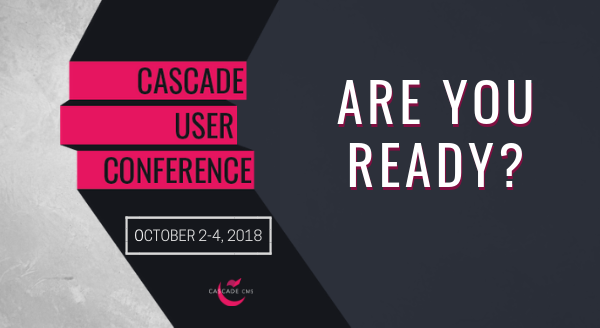 Next week Hannon Hill will launch its 13th annual Cascade User Conference, uniting Cascade CMS Administrators, Developers, Marketers, and End Users from across the nation. During this three-day event, we’ll discuss the latest in web development, content strategy, content marketing, and much more. We’re more than a little excited to kick off this year’s festivities. We’ve got workshops, one-on-one feedback sessions, and social events to help make this conference unforgettable. The Keynote: We’re bringing you Mia D. Martin for this year’s keynote address. With over 20 years of sales, marketing, and training experience, she is going to highlight the importance of personalization and help us network for success. The Sessions: We’re offering more than 30 different sessions showcasing what users have accomplished with Cascade CMS. Get tips, tricks, and ideas from your colleagues, as well as Hannon Hill developers and trainers. The Social Events: After a full day of sessions, unwind with your peers at our social events. We’re hosting our welcome event at Hudson Grille in Midtown Atlanta. Wednesday we’re upping the ante with an evening at the picturesque Park Tavern overlooking Piedmont Park. To all registrants, please check your email inbox for a message containing conference FAQs. For any additonal inquiries, please email us at conference@hannonhill.com. We look forward to seeing you there!